Ronan A Cahill, Dr. European Institute of Surgical Research and Innovation (EISRI)The potential of single port laparoscopic operating is at present greatly constrained by the currently available commercial devices in both their design and construction as well as their cost (which restricts their usefulness by both limiting the potential patient population and preventing their use for the recapture of abdominal access wounds during conventional multiport surgeries). 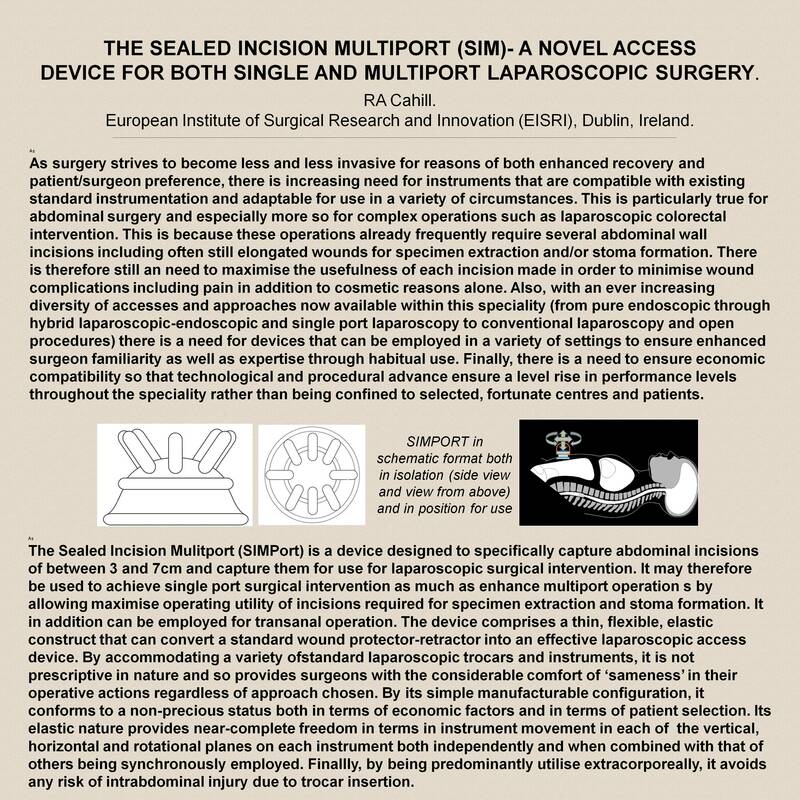 We here present a new port concept and design that is simple and cheap to manufacture while being robust, flexible and highly useful for laparoscopic and endoscopic surgeons in a variety of specialties’.This novel port, provisionally entitled the ‘Sealed Incision Multiport’ or SIM port, comprises a single sterile, continuous, thin, clear, elastic membrane that connects securely onto the external ring of the standard wound protector-retractors in common use. The configuration of the membrane comprises a lower short cylindrical chamber with an upper dome on which several access conduits are mounted. Standard and specialized laparoscopic instruments of various sizes can be inserted through these conduits either directly or via placed laparoscopic trocars with a secure gas-seal being provided by elastic ties or gas-valves respectively. The translucent nature of the membrane facilitates the easy guidance of instrument tips into the abdominal cavity while the elastic quality of the membrane provides considerable freedom for independent movement of the instruments in all of the horizontal, vertical and rotational planes. Because the access devices connects onto a standard wound protector-retractor, it is ready for use across a broad spectrum of patient body sizes and shapes and is easily compatible with all disposable, reposable and reusable laparoscopic instrumentation in use worldwide As the device remains extracorporeal, it eliminates any propensity for intra-abdominal trocar injury during insertion and encourages use of simple trocar sheaths in favor to more sophisticated shield blade technology systems. Additionally, the thin nature of the device reduces requirement for re-sharpening reusable laparoscopic trocars. By these means, and in combination with the simple material and manufacture process, this device allows the cost of the laparoscopic access to be markedly reduced in comparison to the present expense of single port and even-multiport operating. Finally the construct of the access device and wound protector-retractor is adaptable for transanal use as a means of facilitating endoscopic operation with rigid and fixed curve laparoscopic instrumentation.In conclusion, the simplicity of design and construction allows the SIM port device to be non-prescriptive and non-restrictive in its use. It is easily used as either the sole access for single port laparoscopic working while it can also be readily incorporated into standard multiport laparoscopic operations (where it both facilitates completion of such surgery and allows for prompt reaction to unexpected findings). In acting as such a bridging device, it provides an ideal platform to ease surgeons through their learning curve for confined access surgical performance and thereby allows stepwise integration of this operative approach into routine practice.